This year, three ITVS-supported films premiered at the 2014 Sundance Film Festival. Filmmaker Thomas Allen Harris showcased both his feature film and transmedia project as a part of New Frontier, a program that showcases multi-media storytelling. These projects inspired ITVS to create a panel focusing on the challenges of fundraising for documentary and transmedia projects. 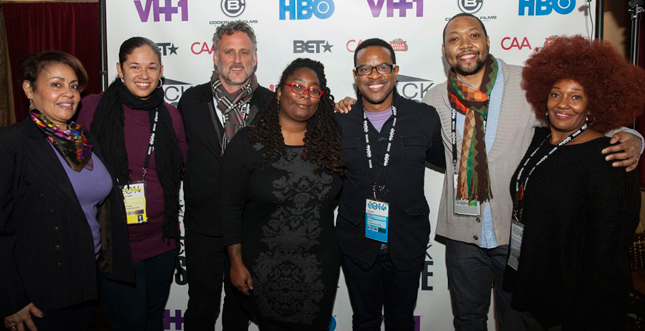 The panel marked ITVS’s first event with the Blackhouse Foundation. For the last seven years, Blackhouse has held a venue at the Sundance Film Festival as a place that both celebrates Black cinema and provides networking opportunities for filmmakers. The panel was packed with experts in the field who could speak specifically to the challenges facing filmmakers. Panelists included Director of Public Media Corps Kay Shaw from the National Black Programming Consortia; Senior Manager Kamal Sinclair from the Sundance New Frontier Story Lab; filmmaker Thomas Allen Harris of Through a Lens Darkly and its transmedia component Digital Diaspora Family Reunion, and myself. The panel was moderated by filmmaker Shukree Tilghman, who also went through the film/transmedia funding gauntlet with his film More Than A Month and the related phone app More Than A Mapp. Lesson One: There are funders looking for innovative content. Kay Shaw and I started off the discussion by describing the various funding opportunities available to filmmakers. Both NBPC and ITVS funded the documentary and transmedia projects by Harris and Tilghman. For ITVS, those projects were recipients of funding through a variety of initiatives, including the Diversity Development Fund, Open Call, and various digital initiatives. Additionally, NBPC offers funding for original web series like "Black Folk Don&apos;t."
Lesson Two: Concurrent documentary and transmedia projects are hard to balance. Being able to raise funding for both your film and transmedia project is both a blessing and a curse. As Thomas mentioned in the panel, the type of funding coming in determined which part of the project would receive his attention. When funding was flush for the film, the transmedia project was put on the back burner and vice versa. This can cause delays in projects and ideally, from a funder or a broadcaster perspective, both the transmedia project and the film would be finished around the same time so you can use one to promote the other. Harris was in the enviable position of having the two projects finish simultaneously, however, this is the result of a project that has been in production for the last decade. Lesson Three: There&apos;s an incredible range of transmedia projects. While there may be some ambiguity around the word “transmedia,” Kamal Sinclair defined it as telling a story across multiple medias. As new technology is constantly being developed, there&apos;s no end to the kind of transmedia projects that can be created. Sinclair recommended doing a deeper dive into the newly launched Docubase, a collection of transmedia projects curated by the MIT Open Documentary Lab. This database also includes specifics on team members, funding, and the technology used on each project, so it is easier to get a clearer picture of the resources needed to complete projects. For examples of ITVS-funded transmedia projects, please visit itvs.org/interactive.